In many respects the CONIAS approach contributes high added value to existing methods of analysis for political conflicts. 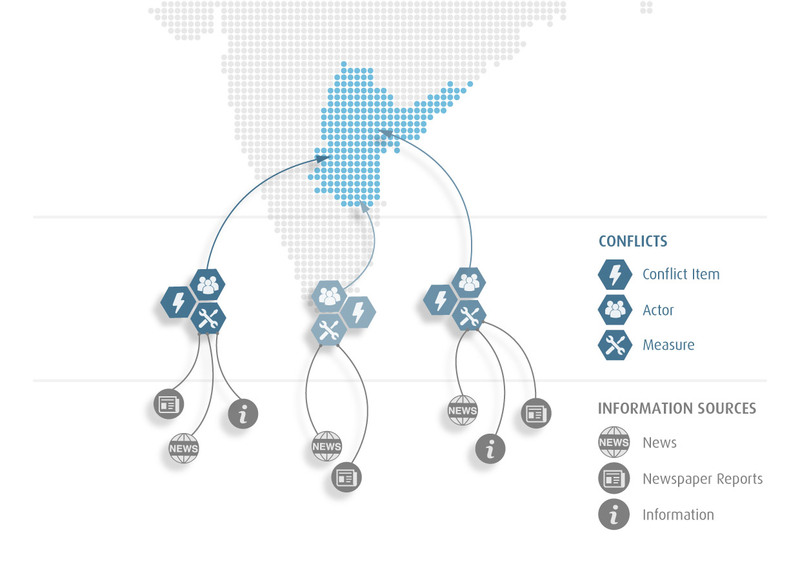 Due to the acquisition of events as social systems within a dynamic model, the whole spectrum of conflict activities can be mapped. The classification of the specific risk is ensured by the application of clearly conceptualized indicators, which in turn are based on the actions and communications of the involved conflict actors, combining qualitative with quantitative research strategies. Via a conceptual differentiation and standardization of data processing, the greatest possible degree of accuracy, comprehensibility and reliability of information can be reached. During the process, the conflict measures, all actions and communications that an actor executes within a political conflict are individually captured within the framework of a measure-catalog. This catalog contains over 200 categories of measures, including judicial, military and protest-related actions, allowing for a broad and differentiated mapping of events. When CONIAS detects a heightened risk or raises the intensity of a conflict, it is always backed by a related third party information, which makes the process comprehensible and transparent. With our catalog of measures we capture the date, duration, actor, addressee and type of the exercised action. In cases of violent actions, we also take the number of fatalities, deployed personnel, refugees as well as the magnitude of destruction and type of weapons used into account. "The first casualty of War is Truth" – scarcely anybody would disagree with this statement. This is why CONIAS especially emphasizes its source selection. Only trustworthy and approved newspapers, journals, internet-news and other online media is used. Naturally, each recorded information is referenced with the corresponding source. This way, all statements stay verifiable. As a paying customer you can inspect all coding, including the corresponding references. This way, you gain full transparency within your risk assessment and are able to check the related articles yourself.